More stuff to read after you’ve OD’d on Boyd’s Discourse. Command in War (also one of Boyd’s favorites; the quote on Organic Design chart 29 starts on p. 199). Are these different translations of the same concepts? Complementary? Contradictory? Would any apply to you? How would you build them in your organization? How could you demonstrate that your program is working, i.e., that you’re having a positive effect on organizational performance? “In an Age of Privilege, Not Everyone Is in the Same Boat,” by Nelson D. Schwartz (very slightly edited for brevity). The premise of “Imperial Class” is that in the limit, they won’t even want you on the same plane with them, and the airline will find it simpler and more profitable just to eliminate coach class entirely. Joe Castaldo tells the tale of Target’s expansion to Canada. Less than two years after opening its first store, Target Canada filed for bankruptcy and closed. The episode cost the parent company some $2 billion, not counting the damage it did to its reputation. I’m observing how there is, at least within management education, a dichotomy between two paradigms; one that builds decisions on the belief that money is the highest value (see Small is Beautiful by Fritz Schumacher) and another that builds decisions on systems thinking, or quality; improving the capability of a system. It’s interesting how Boyd described Orientation as the Schwerpunkt of his thinking; the paradigm through which to observe one’s environment, including new and unforeseen circumstances as they unfold. The slides from my keynote at LeanKanban Central Europe 2015 are now available from the Articles page. The originals were done in Apple Keynote and had quite a lot of animation. It is possible to export as a PDF with each stage of a build saved as a separate slide. This only works, however, for simple builds, like “Appear,” and it makes for a very large file. Instead, I’ve reformatted a few of the charts and exported as a regular PDF. Even with all that, it still comes in at 6.5 MB. You can watch the keynote address itself from Munich at https://vimeo.com/146524156. All about agility in 400 sec. At a special event midway through the first day, five of the presenters at LeanKanban 2015 gave short presentations on various topics. The trick was that you had to have an intro slide, an outro slide, and 20 content slides, each of which was timed to display for 20 seconds. In the video below, you can see the timing ball moving inexorably across the bottoms of the screens. 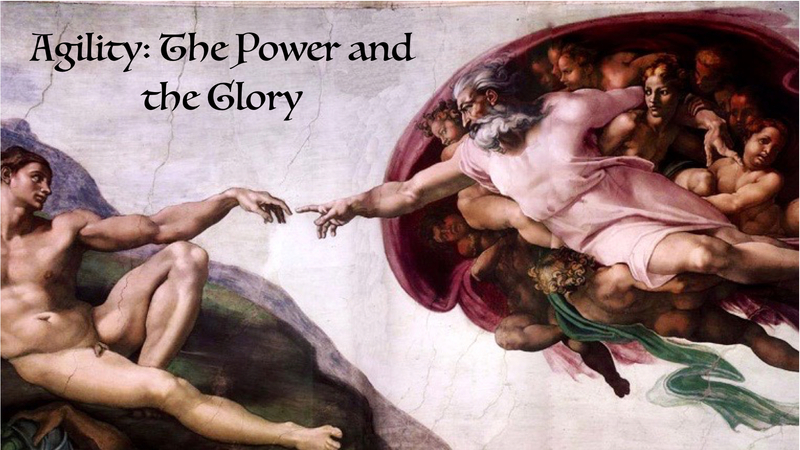 Mine was modestly entitled “Agility: The Power and the Glory.” The software development community has a concept of agility, and if you search on “SCRUM” you can get an idea of how it works. Apparently it works well because lots of development teams use it. The way the developers use the term is the same as Musashi’s chapters 2 and 3, where he discusses tactics and techniques. This is important stuff because poor technique can ruin an otherwise brilliant strategy. But like Sun Tzu, Musashi goes on to insist that the real purpose of agility is to drive the terms of the conflict, to ensure, for example, that what you develop succeeds in the marketplace. Nokia, for example, didn’t go out of the phone business because of poor technique in building feature phones. Agility should govern strategy — what to develop — as well as tactics and technique — how to develop it. As I explain in this 20-slide talk, one of the really cool things Boyd did was to extract the essence of agility from something like “super maneuverability,” that is, a hardware concept, and move it into the pilot’s mind. My little talk shows that this proceeded in stages first by noting the ability to handle change, then in the idea of “operating inside the OODA loop,” and finally to the concept of orientation. This progression is critical to the concept of agility because otherwise you have a big problem explaining why the Red Baron’s Fokker Triplane from WWI, which was among the most agile aircraft ever built, didn’t even stay a front-line fighter for the whole war. As an added bonus, I deconstruct the OODA “loop,” the big one from The Essence of Winning and Losing, in 60 seconds. All of the little talks are worth watching, and mine begins at about 35:40. You’ll occasionally hear voices in the background. To reduce the times needed for changeovers, we were all miked and in the excitement, we sometimes forgot this simple fact. The MC is Markus Andrezak of the German company Überproduct in Potsdam. 20 by 20 with Pawel Brodzinski, Chet Richards, Nadja Schnetzler, Karl Scotland and Dominica DeGrandis at LKCE15 from Lean Kanban Central Europe on Vimeo. Gators, by the way, are extremely agile. Don’t be fooled into thinking they are just sluggish, belly-dragging lizards: They do the cheng / chi maneuver (abrupt transition from expected to unexpected) better than any human I’ve run across. 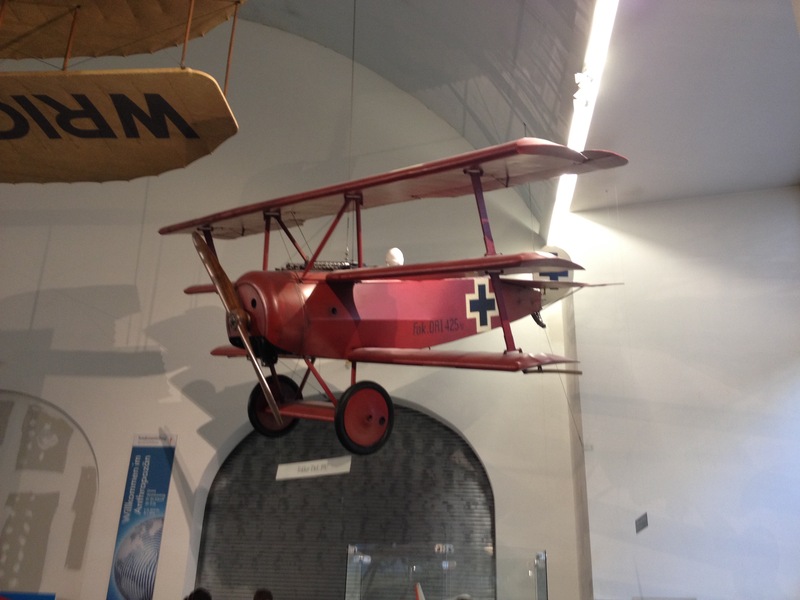 Replica of a Fokker Dr.1 Triplane in the Deutsches Museum, Munich. A very agile airplane, but not very fast, so by the end of the war, no longer capable of operating inside opponents’ OODA loops. If you look down through the sweep of history, you might see two broad trends in the concept we call “agility” or “maneuver.” In the military, including the martial arts, people have known that certain practices could disorient opponents, making the physical act of combat much easier to win. Among these were deception, ambiguity (the “fog of war”), the ability to operate at a rapid tempo, and especially a rapid shift between what the opponent expects and what they experience. The oldest known documentation of these ideas comes from the Sun Tzu text, fragments of which date back to 300 BCE, and they flow like a stream through later Chinese commentators, the Japanese samurai, various schools of the martial arts, the campaigns of Genghis Khan, the German “blitzkrieg,” and on to our day via the works of John Boyd and the US Marine Corps doctrine of maneuver warfare. Sometime after World War II, in Japan, they jumped the military track and into, of all things, automobile manufacturing. 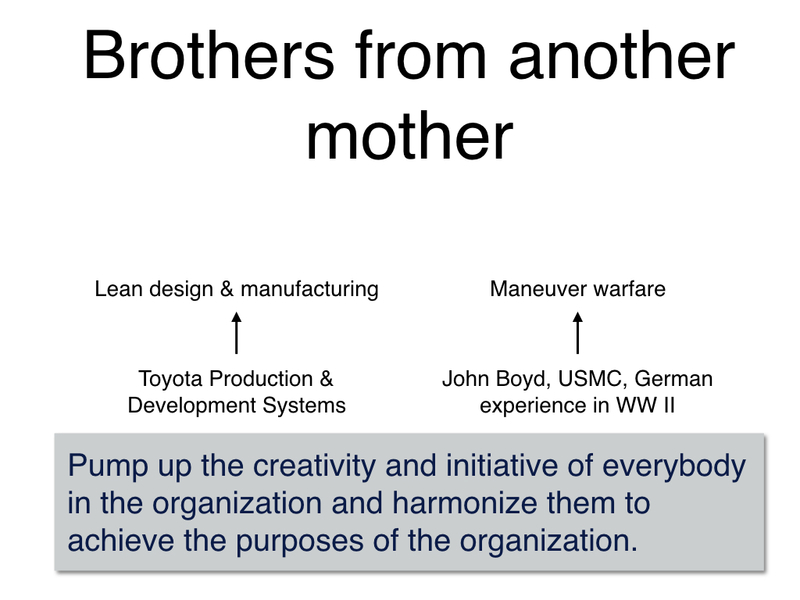 Known today as “lean manufacturing,” the philosophy and set of practices that began as the Toyota Production System broke longstanding tradeoffs between cost, delivery time, and quality. Before the TPS, and in US auto manufacturing up until the 1990s, higher quality meant higher costs. The TPS showed that it was possible to build better cars cheaper. Both maneuver warfare and lean are mature concepts. One could argue that all the elements that define maneuver warfare were identified and in place no later than the early 1940s and might even make a case for 1936, when the German Army issued its doctrine for command of troops, the Truppenführung. If you’re interested in the details, Martin van Creveld provides an extensive analysis of the Truppenführung in his book Fighting Power. These concepts were refined by John Boyd, Bill Lind, and a group of young officers in the Marine Corps beginning in the early 1980s and reached what is essentially their current state with the publication of Marine Corps Doctrine Publication 1, Warfighting in 1989. It’s been 20 years since anything significant developed in the world of maneuver, agile, and lean. My 2004 book, Certain to Win, looked more at the relationships between maneuver and lean. It was the first to point out the common foundation of maneuver and lean, particularly the “human” factors that underly both (by “pumping up creativity …”). It noted that in business, the military concept of grand strategy reduces to “ordinary” strategy. It offered an interpretation of the maneuver concept of cheng / chi that, by focusing on the customer, not the competitor, works for business, too. Good foundational stuff, but it wasn’t written to divert the lean / maneuver pattern into a new field of application. Lean kanban incorporates many of the practices associated with classical maneuver / lean theory: managing flow, limiting work-in-process inventory (which can hide problems and distort orientation), and employing an hypothesis-test methodology for learning. 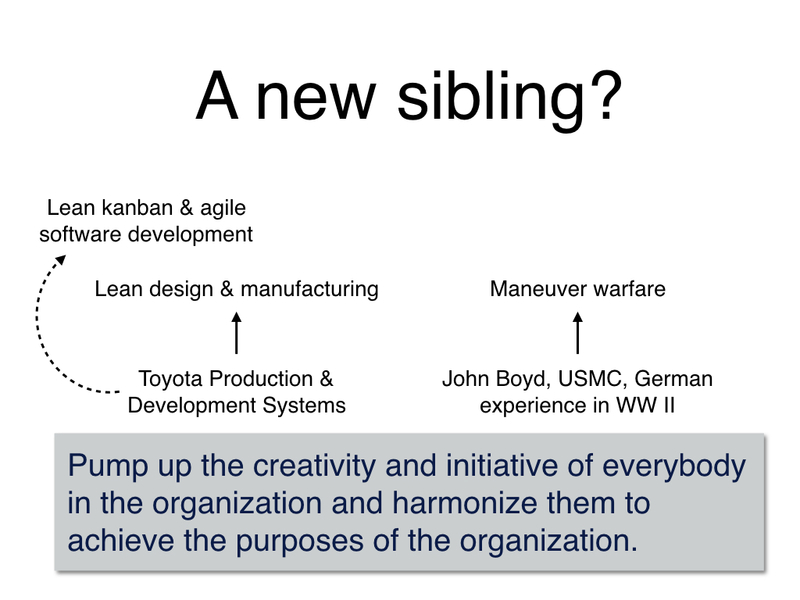 According to the web site of one of its founders (and a keynote speaker at this conference), David Anderson, it also “encourages acts of leadership at all levels.” Depending on how they implement this idea, it could be in harmony with “Pump up the creativity and initiative of everybody …” Because this concept is the real foundation of classical lean and maneuver, I’d need to know more before pronouncing a final judgment. Looks promising, though. For more information, check out the conference’s sponsors — there are links down at the bottom of the conference’s home page.